Substantial reconfiguration of an existing operating room for integrated radiography imaging. 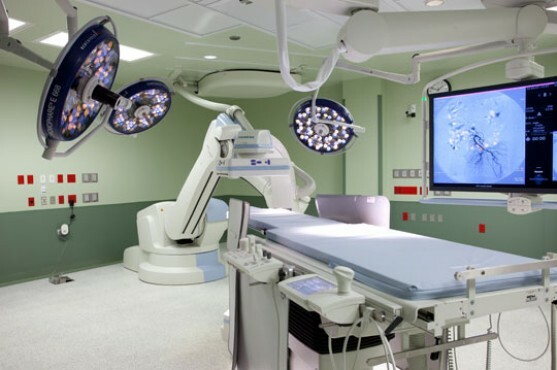 An operating room was completely restructured to receive a dynamic radiography imaging unit. This had to be coordinated with the dynamic and overlapping movement of ceiling mounted equipment and anesthesia booms. This was perhaps our most challenging coordination effort on a project. The instruments were positioned on the room diagonal to maximize clearances at foot and head of the operating field. A control room is positioned at the foot of the field and off to the side there is a supporting electronics room.